There is often a natural antipathy between the financial sector and the community sector. If you give the dog a bone, say the money men, he will only rub it in dirt and bury it. If you give the bank a bone, say the community workers, it will charge you interest on the transaction. But sometimes we are nudged to reconsider our reflexive prejudices. A joint venture between a bank and a community organisation, which offers opportunities to African immigrants in Australia, provokes more constructive reflection on the relationship between banks and the community sector. Whereas the engines of a capitalist economy tend to commodify human values, this venture appears to humanise commodities like money. 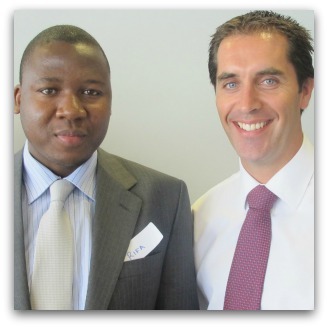 The project is designed to help African Australians find work in the business sector. It arose out a conversation between a staff member from each organisation about the difficulty experienced by many Africans in finding employment commensurate with their qualifications. The bank culture supports community involvement generously; the community organisation works within the African community. So the project could begin. In the project successful applicants are placed for six months in an intensive program of paid work in an area for which they are qualified. Staff members of the bank assist them by directing, mentoring and supporting them. By the end of the program they will be able to apply for positions, participate in interviews and enter employment knowing that they understand the Australian business culture. Of the over 90 people involved in the program over four years virtually all have subsequently found work, many at the bank. A review of the project, commissioned by the bank, embodies the perceptions and expertise of the financial sector, and is challenging precisely for that reason. It describes the project in commercial terms, asking how the stakeholders benefited from it. The stakeholders are broadly defined, including the participants, both successful and unsuccessful, the sponsoring organisations, the participants' relatives, the African Australian community as a whole and the bank staff who supported the applicants. The benefits to stakeholders were also broadly defined to include income, personal satisfaction, sense of self- worth, achievement of personal goals and connection. In the evaluation, which adopts a widely used methodology that included structured interviews with the stakeholders, these benefits are given a monetary value. By these calculations, the program returned over six dollars of value for every one dollar invested. Needless to say, the judgment of the project by the two institutions involved (the National Australia Bank and Jesuit Social Services) was favourable, with the African Australian community wistfully hoping that more businesses will offer projects conferring such great benefits. The idea of giving a financial accounting of intangible qualities such as job satisfaction and changes in family relationships or in self-worth is provoking. It seems presumptuous to put a cash value on qualities of human experience and development that are priceless. It could entrench commodification. But in practice the results of this accounting call into question many uncritical assumptions made about what matters in government and corporations. They reveal, for example, how thin and misleading as a basis for public policy is an accounting that covers only transactions in which money changes hands. To leave out of accounting, and so out of policy making, the benefit conferred by open space, by unpaid work in the home and by the satisfaction derived from voluntary work, seriously distorts the human economy. If public conversation is helped by representing within the budget the value of such things in monetary terms, the end would surely justify the means. The evaluation also provokes reflection on what matters in commercial enterprises. The bank staff involved in this project were clearly great beneficiaries. So was the bank, through the breadth of experience, the fresh understanding of society and the renewed enthusiasm gained by the staff members. This benefit argues against the myopic view, commonly expressed in the financial sector before the GFC, that a corporation's only responsibility is to its shareholders. Only if it looks to the welfare of all those who play a part in its work will it thrive in the longer run. The success of the project also suggests how important connection is for any society or business. The connections made with the bank clearly benefited those who participated, their families, their mentors in the bank and the bank itself. Large enterprises often want their employees to have a strong and narrow focus on their central business. But this project suggests that the broader the connections, interests and allegiances of the bank staff, the more they can build within the bank a shared understanding of the community on which the bank itself depends. A social awareness is not merely an adornment of a bank. It promotes its flourishing. I still cavil at giving human values monetary value. But the practice clearly has its advantages. And, after all, Jesus advised his followers to make friends with the mammon of iniquity, even as they thread their microscopic path through the eye of a needle. Andrew Hamilton is consulting editor of Eureka Street. He is also a policy officer for Jesuit Social Services, the community organisation referred to in this article. The joint venture between the NAB and Jesuit Social Services is to be applauded. I'm aware that the NAB allows all employees a number of days leave per year to undertake voluntary work for community organisations. I'm concerned though about immigrants, from Africa, and elsewhere, who arrive in this country with limited formal qualifications and below par language skills. And sometimes they are sponsored into an area where job vacancies are also limited. This presents quite a challenge to the immigrants and to the community organisations involved. I take note of your final sentence Andrew - Jesus' advice is always heaven-sent! There are two viewpoints in business, Competition and Cooperation. For too long Competition has reigned in an extreme measure. It is encouraging to see Cooperation playing an increasing role. The human body is a great exemplar of the cooperation of trillions of individual cells, each with a life of its own, all working for the good of the whole. If only the millions of persons in the great Human Body, (the Human Race), could learn to do the same, we could look forward to even greater prospects of prosperity and peace, with businesses and nations engaging in friendly and cooperative competition, instead of the self-centered tactics that prevail at present in too many places. "This benefit argues against the myopic view, commonly expressed in the financial sector before the GFC, that a corporation's only responsibility is to its shareholders." But that is the way our laws expect directors to operate isn't it? What about now, after the GFC, isn't that view/law still there? The very same people who support that, argue against any state support for individuals, except to bail out badly run corporations and private industry at every turn, of course. So this is, maybe, an interesting sideshow to the primary focus of banks and 'industry' generally but that's about it. Does NAB run a program for Indigenous peoples to maximise their role? Or in one of those 'politicians sink holes', like Penrith or Logan or those in other cities? Probably not. No, this is merely another 'feelgood' project that has no fear of challenging the main game - looking after shareholders and paying CEOs and directors as much as they can immorally squeeze from those same shareholders they care so much about. Plus of course, it helps to justify the Jesuits continued existence and helps deflect criticism from the Vatican for all its immoral behaviour and policies. Thank you for a nicely balanced essay. I agree that commodification of virtues such as altruism is distasteful and not to be sought as a goal. On the other hand, putting a dollar value on some social programs can be used to prove that one does not need to be a “bleeding heart” to effect a long-term good by paying for politically-vulnerable /controversial programs.Just two examples include training young people from lower-socio-economic backgrounds in needed workplace skills so they can get real jobs, and supporting troubled youth and their families in order to reduce the incidence of incarceration and recidivism. Such programs have been shown to work, yet time and time again, they become the victims of societal resentment (fuelled by those with their own agenda), “short-termism” and concomitant funding cuts. The cost of incarcerating someone (for example) far outweighs any money spent on ameliorating fundamental problems. A constant and vocal emphasis on the long-term financial benefits by we “do-gooders” might help politicians overcome cowardice in the face of right-wing bullying, and society to understand the benefits that accrue by doing the right thing by 'the least of our brethren'. It sounds so like a good news story,welcoming newcomers, employing people, co-operation and benefiting bank staff. However if you are going to sup with mammon you need a long spoon. Far better for a bank or any organization than money spent on advertising is a good news story which just looks like a piece of news. Ask anyone in the PR industry. And it is a great way to retread a tarnished reputation and reconstruct perceptions. So for the bank mentioned there is the benefit of a good story, there is a $1 to $6 return on investment, the bank gets a chance to employ people who are obviously linked with an ethnic group which is a part of the market, it looks good to be helping 'blacks', it cuts training costs and staff advertising costs and it increases staff productivity by virtue of the experiment and the Hawthorne Effect. Then of course if an organization can boast it is co-operating with the Jesuits in most perceptions it must be a smart and ethical organization. And the article proves how well the bank has done, isn't it wonderful. As for dry cleaning a tarnished reputation is possible I cannot wait to hear that Eddy Obeid is either enrolling relatives at Riverview or Xavier or building a boatshed for the colleges. Another important reflection from Andrew. This kind of cooperation between the community and financial sector is a hopeful sign and a practical demonstration that we're all in this together! Just to reassure Janice Wallace - the NAB does indeed have similar projects in 'politicians' sink holes' including Logan City. I'm not connected with the NAB in any way, but I've had a lot to do with other programs which use NAB capital, community sector (Good Shepherd)on-the-ground knowledge and skill, and significant federal government support. These programs have been running Australia-wide for many years, across many electoral cycles and several different governments. There's more good will and good skill out there than you think! Jesus also called money "tainted" so beware of fondling it too closely - arms length always, and nostrils pinched. I also agree with those who warn us to use a long spoon when supping with the devil. It's very easy to be 'captured' by the funder, even though we talk the language of partnership. It's never an equal partnership when one partner has the money. Remember the Golden Rule - he who has the gold, makes the rules. (The Gospel According to Johnny Hart).